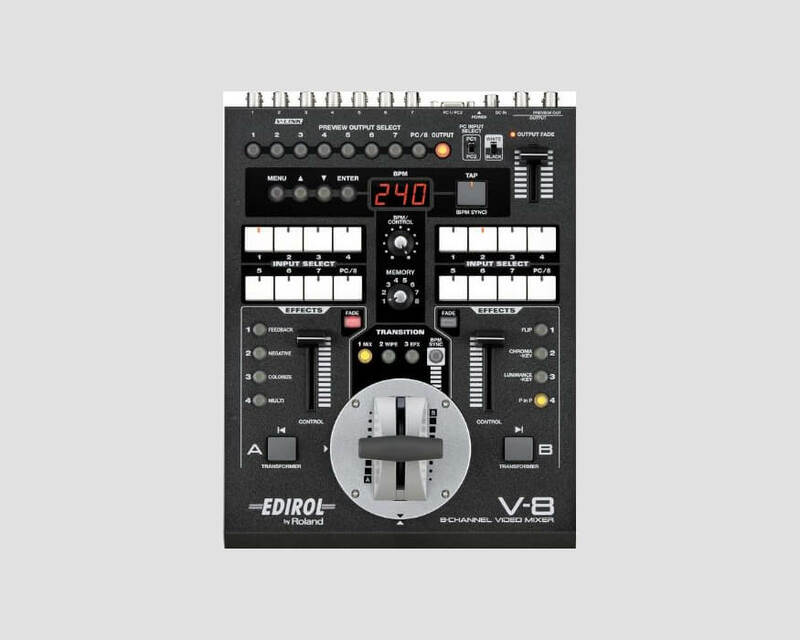 The Roland V-8 is a powerful, easy to use eight-channel video mixer capable of switching between eight cameras or video tape decks during a live performance with smooth transitions and special effects. The V-8 is an affordable solution for the video needs of houses of worship, schools, and nightclubs. Video sources are processed completely in the digital domain for professional video quality (13.5MHz, 8-bit, 4:2:2). The V-8 is ideal for use on large screens, and because the internal processing is digital there is no quality loss to the output signal. Two Channel TBC / Frame Synchronizer Input sources go through independent two-channel TBC (Time Base Correction) circuits and two-channel frame synchronizers to ensure smooth transitions and stable images.